Hola amigos! 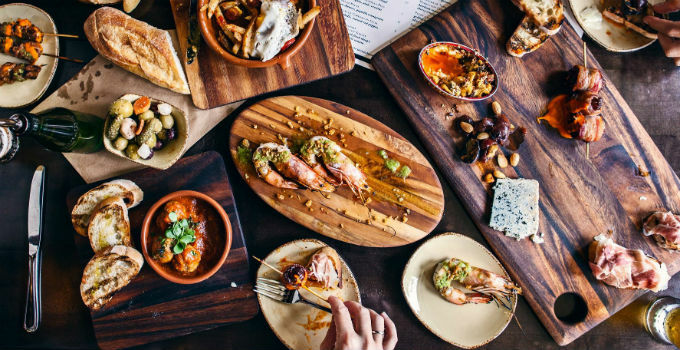 We know, you’re totally intimidated by our incredibly fluent Spanish but we just wanted to get you in the mood for a tapas feast at one of the best Spanish restaurants Brisbane has to offer. From manchego croquettas to paella, and every sangria jug in between, Spanish fare is made for sharing. So if you’ve got a craving for some spicy chorizo and crisp patatas, grab your own amigos and find a table at one of these flavoursome spots. Along with sister venue Ole Fuego at Indooroopilly, Ole is all about feasting with friends, which is why their entire menu is dedicated to share plates. Don’t attempt to pronounce anything when you order, just point and let their sangria get your tastebuds ready for stuffed baby squid, slow cooked lamb shoulder and paella packed with prawns, squid, mussels and clams. For top shelf Spanish fare with Italian and French touches, head to Moda, where you’ll find crispy croquettes and sweet piquillo peppers alongside duck liver parfait and confit duck leg. Just be sure to save room for dessert, because you’ll go loco for Spanish crème caramel. You’d better have a game plan before you open the menu at Peasant, or you’ll be staring at the tapas options in agony over what to order for hours. If it’s been 15 minutes and you still haven’t been able to choose between the mussels in sherry and saffron cream or octopus marinated in paprika and garlic, just ask for the La Familia and let the kitchen deliver you a six course banquet. Feel like tapas but bae has their heart set on steak? You’ll find both at Toro Bravo, where streaky bacon wrapped dates and lamb and haloumi skewers are on the menu alongside Black Angus eye fillets and sticky beef shortribs. Hot tip: Have your dinner date on a Tuesday and you get two meals for the price of one. Feel like some tapas now? Of Cortez you do.